waiting around, learn how to plug the tire yourself. You’ll be back on the road a lot sooner and you’ll have saved yourself a lot of grief. For starters, you’ll need some kind of an air tank, air compressor or tire inflator (battery-powered, portable versions are available). You also will need a tire plug kit, needle-nose pliers, and some muscle. It’s a good idea to keep the air source and tire plug kit in your trunk along with your tire care and cleaning supplies. Having a jack as well would make this job easier; however, it’s not required. If you are on the road, look for the object that punctured the tire. Check the sidewalls and the tread — but don’t pull the object out when you find it. If you have a jack, jack the car up and rotate the tire first until the puncture spot is in the 2 o’clock position. If you don’t have a jack and can’t immediately find the puncture spot, have a helper look for the offending piece that punctured the tire as you slowly drive forward or backward. If you are home or otherwise have access to soap and water, mix a bit of dish soap with water and then “paint” the tire with it. The soap will bubble where the air is leaking from the tire. Plug It or Patch It? When the hole is smaller than the plug, you’ll be able to plug a tire, otherwise, you’ll have to patch the tire or replace it. 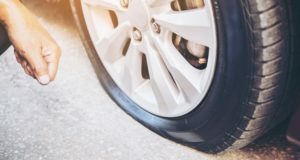 While you can plug a tire yourself, you likely won’t be able to patch it yourself since you have to separate the tire from the rim to patch it, and that takes special equipment. To patch the tire, have the vehicle towed to a shop or remove the wheel and bring it to the shop. If you do need to buy one or more tires, buy tires based on your usage. Once you find the puncture, move the vehicle so that the offending object is at about the 2 o’clock position. If you are using a jack, turn the wheel until the puncture or object that punctured the tire is at the 2 o’clock position, and then let the jack down so the weight of the vehicle is on the tire. Prepare the plug before you pull the offending object out. Peel the plug off the backing and then thread it through the plug tool. This is the tool with a hole in the end of it. Center the plug in the hole and then pull both ends up toward the handle. If you have an air source, inflate the tire to make inserting the plug easier. If too much air has leaked out of the tire you may not be able to plug it until you are able to get the tire somewhere to inflate it. If the tire has quite a bit of air in it, quickly pull the object that punctured the tire out (the needle-nose pliers come in handy for this task), and then push the reaming tool into the hole. Without completely removing the reaming tool, push and pull it in the hole a few times. This cleans the hole and makes it a little bigger so the plug fits and stays in place. Before you pull the reaming tool out, have the tool with the threaded tire plug in your other hand. As soon as you pull the reaming tool out, push the tire plug tool with the plug into the tire until the plug is inside. Pull the tire plug tool out with a slight twisting motion. The plug will stay in the tire and the tool should come out clean. Follow up by inflating the tire to the proper level. 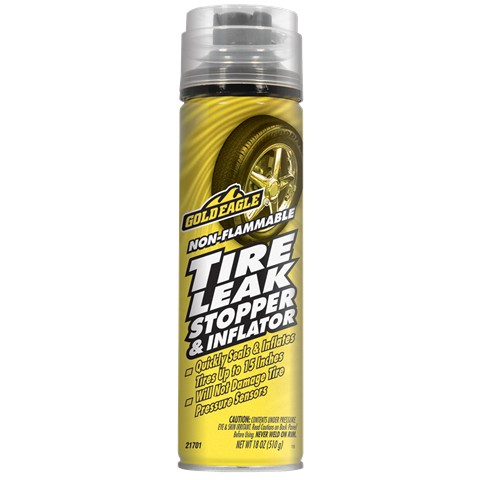 If you are unable to use a plug kit on the road, you can temporarily repair the leak — with no other tools or a jack — with the Gold Eagle Non-Flammable Tire Leak Stopper & Inflator. You can drive on a plugged tire for an indefinite amount of time. However, if you have more than one plug in a tire there’s a better chance that a plug will fail and leave you with yet another flat. This is when you should purchase a new tire. This is something I can use, I have a few tires that keep going low on me one the car and the snow blower and I can’t find any leak. We have done a water test on them and nothing shows up. So this would be great for me if it seals the leaks. My plug kit instructions say the plug repair is only temporary. Inflated flat did not plug drove to tire shop. The repaired tire with plug and said it is permanent repair. Why can’t I buy plugs that are permanent in auto supply shop?